After a less-than-satisfactory performance in our last playtest, the Demonic hordes would take to the field one last time in a clash against their hated foes, the Angels of Divine. Under new leadership, would they at last assume their rightful place of dominance in the multiverse, or would the heavenly host flush them like so much offal back to the hells they spawned from? We played the customary three matches to find out. And so the earth cracked and was torn asunder as the forces of Hell boiled up from the abyss to meet the legions of Heaven descending from the sky. 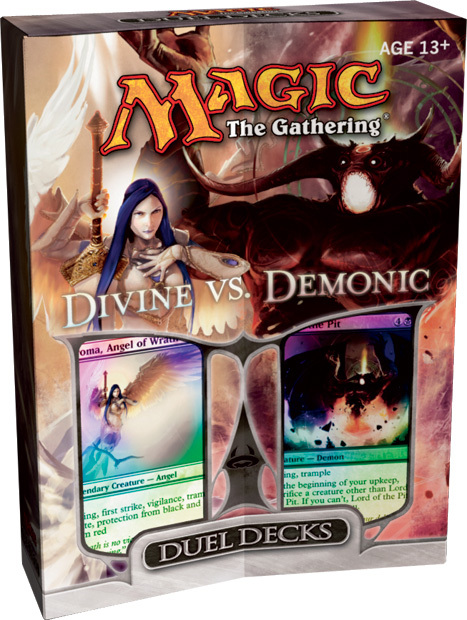 Alternately… Sam and I sat down at the table to pit the Divine against the Demonic for a series of three games, to see how each deck would perform. The former may sound more full of Sturm und Drang, but on a lazy Sunday afternoon the latter was just what was called for. Here are our notes from the three games. Far from the hallowed heights of heaven, today we descend into the brimstone pits of hell to take measure of the infernal forces arrayed against the Divine deck. When it comes to the Duel Decks, the second analysis is often the more interesting one, as the grand vision of the decks’ designers comes into focus. For Divine, we had a trade-the-early-game-for-the-late-game strategy, with gobs of absurdly expensive bombs, little removal and even less ramping. The idea there was to stall out for the early and mid-game with some light creature presence, then take over the skies as early as turn 4 and beat down your opponent. There are, naturally, a number of different responses to this strategy. Obviously, there’s always the option of the ‘mirror’- do the exact same thing, but in Black (this was the Anthologies method). Alternately, you could go the other direction entirely and show a contrast in strategy, meeting a slower opponent with a faster Black creature rush (as seen in Phyrexia vs the Coalition). In the end, however, it looks as if Demonic charts something of a maiddle path here. Faster than Divine but not blisteringly fast by any means, it comfortably moves into the ground abdicated by Divine and demands control of the mid-game. 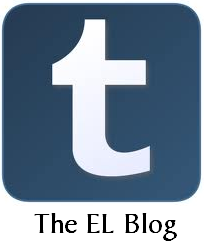 To see how it accomplishes this, we’ll turn now to the creatures of Demonic. 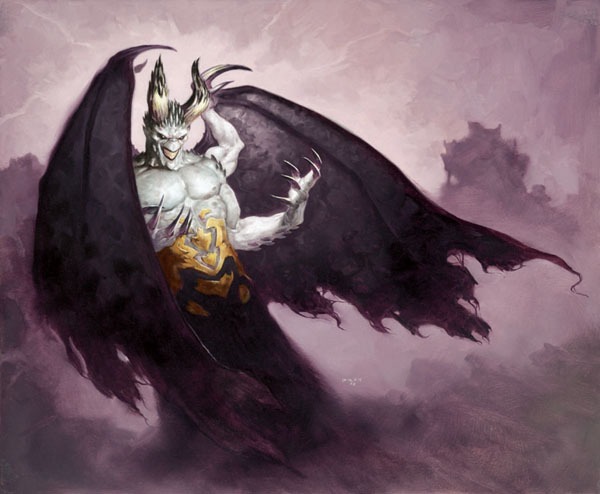 Flush off the success of 2008’s Duel Decks: Jace vs Chandra, Wizards alternated back to the “tribe vs tribe” theme that had kicked off the series (Evles vs Goblins) with the April 2009 release of Divine vs Demonic. Featuring some of the all-stars of the Angels and Demons factions, the set pits a mono-White deck versus its mono-Black counterpart. In both cases, the designers have followed a strategy of “large creatures, light ramping.” This balance tends to yield a relatively uneventful early game with things picking up in the mid- to late-game- heavily lopsided games are always possible (this is, after all, Magic: the Gathering), but in general there should be some dynamic interactions between the two decks. 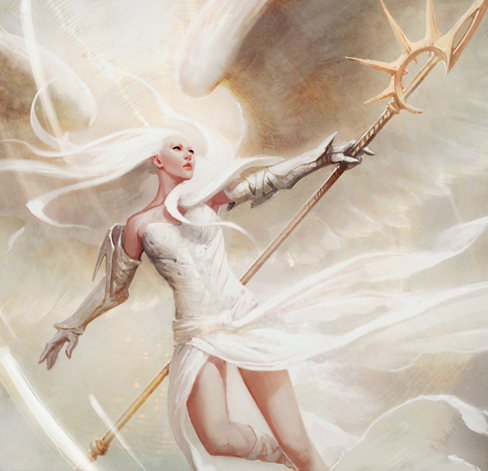 Today we’ll be taking a look at the mono-White Divine. Packing in an impressive fourteen Angels, the question then becomes whether or not the deck sacrificed some playability for flavour. That said, Duel Decks aren’t like your normal preconstructed products, as they’re generally only intended to be balanced against each other. A deck can be nearly unplayable, but if its opposite number is equally so then voila! Balance! Obviously it is not in Wizards’ interest to develop an unplayable product. Instead, what this means is that in reviewing the Duel Decks, we shouldn’t judge too harshly when we note that there are a higher-than-comfortable number of very expensive spells in the deck if it is a component of the play experience the Duel Deck is trying to foster. With that said, let’s now turn to Divine and see how the deck has been constructed, starting of course with the creatures.